WE CAN PROVIDE TICKETS AND BUS AT AN EXTRA COST. 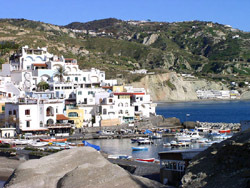 Volcanic in origin, Ischia is famed, above all, for its thermal waters and beautiful beaches. Inhabited by 2000 BC became an important stop along one of the earliest trade routes in the Mediterranean, from Mycenean Greece to the Etruscans of northern Italy and the mines of Elba. The first hint of Ischia's volcanic origins comes when you enter the almost perfectly round harbour of Ischia Porto, formed by a sister crater of Monte Epomeo. It was only connected to the sea in 1855, when Ferdinand II's engineers carved a narrow outlet.The island covers just over 47 sq. km and its prominent feature is Monte Epomeo, near the center, a volcano that was a powerful force and source of worry for the Greek colonists who settled here in the 8th century B.C. Besides the sandy beaches, the health spas (which utilize the hot springs for hydromassage and mud baths), the island is famous also for the vineyards producing the red and white Monte Epomeo, the red and white Ischia, and the red and white Biancolella. THE PRICE OF THIS TOUR IS OF EUROS 240. ENTRANCE FEES ARE NOT INCLUDED.